If you need to edit audio files to make your own music and beats, then check out, an advanced music editor that is free and easy for users of all levels. 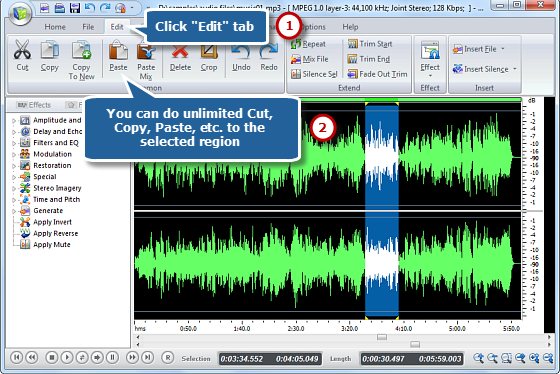 With this program, you can edit music files with classic editing functions like cut, copy, paste, mix, trim, etc. easily. 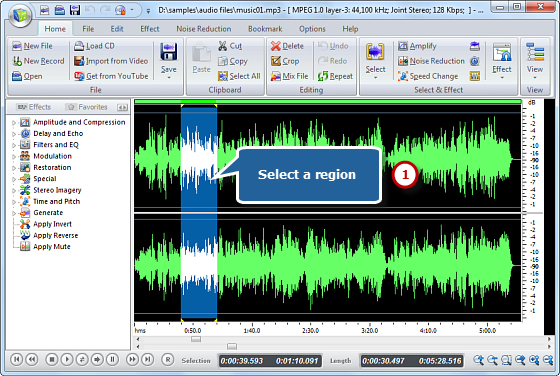 Free Audio Editor allows bookmark and region management. Unlimited UNDO/REDO is allowed to restore or redone the operation. Read on because this post will how you exactly how to edit music and audio files via Free Audio Editor. 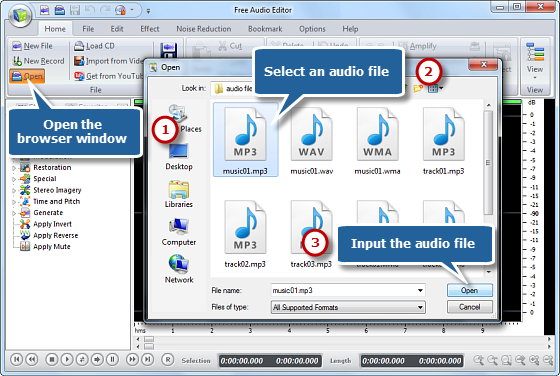 Free Audio Editor also allows you to record audio from any sources with a click of button. You can directly load the recorded audio as a waveform for any enhancement. It lets you create music CD with the built-in CD burner so that you can play it in any stereo, send to friends or use as a backup of your music collection. For those people who have been visually impaired or have dyslexia for reading, Free Audio Editor can be extremely helpful. It provides a free text to speech tool which enables you to input the text and make it read the content to you. It’s also ideal for overcoming the language barrier to proofread some online documents. Launch Free Audio Editor. Click “Home – Open” to activate a browser window, in which you can select an audio file from your computer. Then, click “Open” to input the audio file to the program. Tips: All the files of the supported formats can be seen in the “Open” window & if you want know other formats supported, activate the “Files of type” dropdown list at the bottom. Input the start, end and length of time to choose specified region at the bottom of the editor. 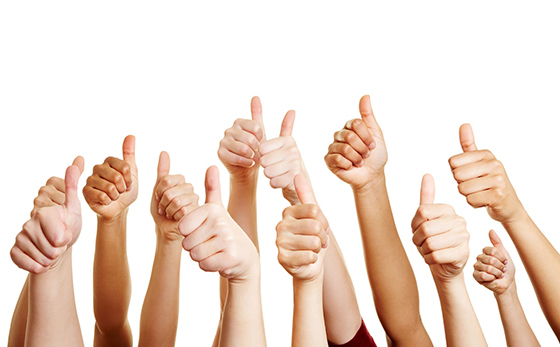 Now click “Edit” tab to edit the selection by clicking the buttons of cut, copy, paste, crop, delete and more. You can use unlimited Undo & Redo to restore some operations made during the editing. Now go back to the “Home” tab and click the “Save” button to save the changes to the original file or click “Save File As” to save the changes with a different file name and/or location. After that you can select the output folder and format as well as adjust the output quality. 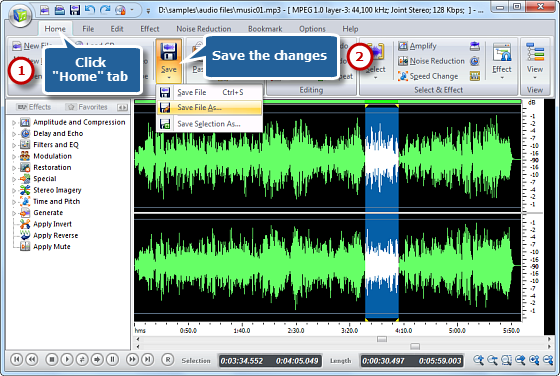 Now, you’ve understood how to edit music and audio files with Free Audio Editor. 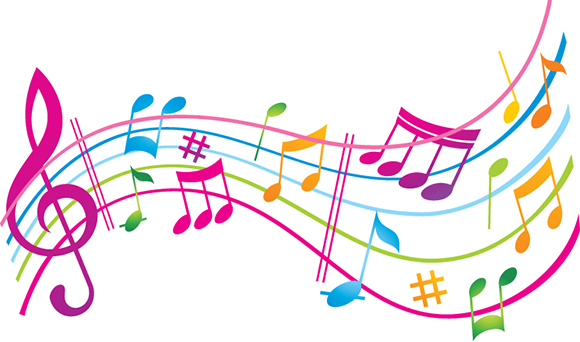 Have great fun with edited music on your music player! Tips: If you are a preliminary user, the presets applied by easily dragging the slider would be very convenient and works for most situations; if you are familiar with the audio parameters and want to get some PRO quality, suit yourself and adjust the numbers. 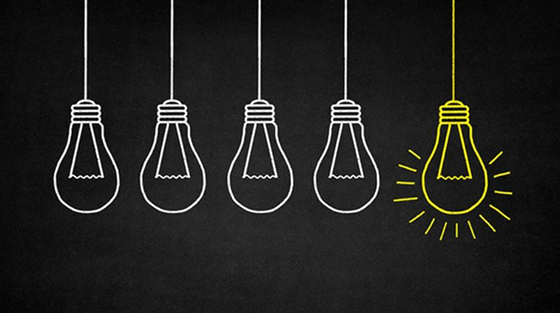 Remember the shortcuts for different editing tools: instead of navigating for different tools, you can speed up the audio editing process. Trim silent audio part: in order to get a much clearer waveform, you need to get rid of some silent parts. Apply Fades: Fade in/out can be applied to any audio part if you want. There is always some noise at the beginning of the audio and adding fades can help remove it easily.